A very worthy successor to the original Taurus. The Taurus 3 marries a modern interface to a classic and powerful sound. Nails the original Taurus 1 sound and mojo. Plenty of hands-free foot control. New MIDI/USB/CV inputs. You might crave more foot pedals. No software editor. It's not cheap. Launched in 1976, produced until 1981 and designed in the main by Dave Luce (the Polymoog designer) the Moog Taurus 1 became synonymous with prog rock bands such as Genesis and Rush (among others). Its appeal was (and still is) largely due to its earth shattering subsonic bass sounds, coupled with the fact that guitarists, bassists and sit-down keys players can all play/ program it with just their feet. 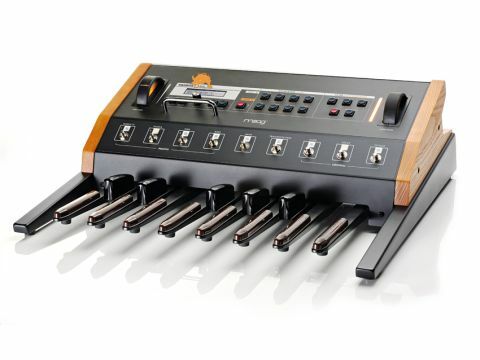 The Taurus 1 was originally conceived as part of the Moog Constellation rig comprising a Bob Moog designed monosynth called the Lyra (used by Keith Emerson in prototype form and described by him as a "Minimoog on steroids") the Apollo (which later became the Polymoog) and the Taurus bass pedals. With a still healthy demand for Taurus 1s second-hand and many requests to resurrect its sound in a new version (with customers enthusiastically paying upfront to fund the project) it's fantastic that Moog has brought back the Taurus as the Taurus 3. At its heart, The T1's (and the new T3's) sound engine comprises two sawtooth wave VCOs running through an (A)ttack (D)ecay (S)ustain amp envelope, then through a classic Moog 904a low-pass filter and routed through an (A)ttack (D)ecay filter envelope with variable contour. But there is one major difference between the Taurus and other Moog designs that make it sound unique. The VCOs are coupled to the filter circuit in a unique way, creating a feedback-type effect that enriches the signal and induces harmonics, while reinforcing the sub-sonic frequencies and slightly compressing the sound, enabling the bass to remain huge but under control. Straight out of the box the Taurus 3 looks stunning - a cross between a Little Phatty and a Taurus 1. Instilling an immediate feel of quality, the main case and chassis are tough metal topped off with solid wood end panels. It's a weighty beast too, at over 20kgs, and should stand up well to road use, though there's a road case available too. Thankfully, the pedal contacts are no longer exposed to the elements like the Taurus 1's, so should hold up much better. The one octave pedal board feels sturdy and is easy to play, though it would perhaps have been nice to have a longer range available. However, it's likely that anything larger would have made the T3 unwieldy for gigging and even more expensive, plus you can always attach a longer set of MIDI pedals or keyboard. The T3's connections are all neatly housed within the left-hand side panel. Included are two mono jack outs (one Hi-Z for connecting to amps, and one Lo-Z for connecting to line level inputs), CV inputs (for controlling the filter, pitch, volume and gate from other CV equipped gear such as other analogue synths, Moog/CV pedals or expression pedals), MIDI In and Out and USB which can send/receive MIDI, plus connect to a computer for future software updates. It's worth noting that there is no filter input or headphone output and it'd also be great to see a software editor for the T3. The front panel is divided into an Upper and Lower level using dual-function Little Phatty style rubber buttons. Upper functions include the main sound shaping controls for oscillators and filter (Osc Beat, Beat Freq, Glide, Octave, Osc Mix and Amp Envelope, plus Filter Envelope Amount, Cutoff, Resonance and Envelope) while the Lower level deals with LFO waves (Square, Tri, Ramp, Saw) plus LFO Rate/LFO Sync, and Pitch/Filter Mod, which can be controlled simultaneously from the right hand programmable foot control wheel. This wheel is one of two oversized yellow-backlit, rubberised foot wheels (the left one being a main volume control). These feel super-sturdy and are nicely balanced for accurate foot control. Visual feedback from both the wheels and large backlit display (which is easy to read even when standing up) is great, and in particular each wheel has a lit position marker which is handy in the dark, plus the control wheel (used for programming and for main sound shaping duties) is augmented by a 15-segment yellow bar display. The lights in the wheels can be on permanently, flash with the LFO speed, or be turned off. There are two operational modes in the T3: Master and Preset. Master mode deals with most global parameters while Preset mode is for performing and selecting sounds. 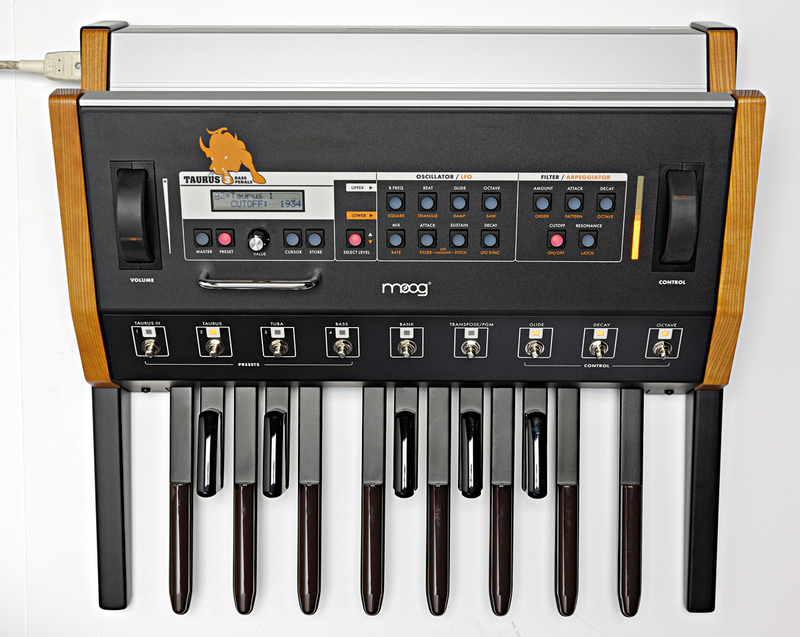 In the Master mode menu you'll find MIDI settings (for using the Taurus over its standard MIDI ports or MIDI-over-USB function) utility functions, plus settings for arpeggiator rate, tuning, note triggering (legato, reset etc) plus a 'note latch' mode that enables the main envelope to remain open for droning sounds. "Thankfully, the pedal contacts are no longer exposed to the elements like the Taurus 1's, so should hold up much better." There's also analogue mode for choosing how the control wheel reacts to the current/ stored preset values, ensuring smooth-sounding parameter changes. Other functions include note priority (low, high and last are available) and pitch bend settings with independent up/down values currently for controlling pitch bends via a MIDI keyboard only, though it would be cool if Moog added the ability to do pitch bends from the control wheel too. The bottom section of the T3 features nine unlatching metal foot stomp switches, each with its own yellow selector light, with the first four switches accessing the four presets in each bank and the fifth footswitch working in combination with the foot pedals to select a bank of sounds from each of the 13 pedals. This makes sound selection by foot a doddle. 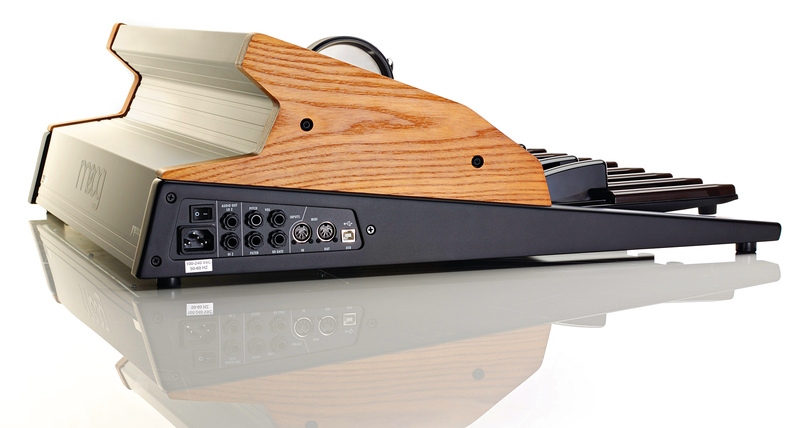 Footswitch six acts either as a global transpose or, if held down, enters PGM mode that accesses further functions via the Glide, Decay and Octave controls (the last three foot switches on the front of the T3). Normally the Glide switch switches on or off the glide function (which sounds fantastic) while Decay adds release to the sound so that it trails off slowly instead of cutting abruptly and the Octave switch jumps octaves. However, in PGM mode, Glide becomes a tap tempo control for the LFO, Decay becomes a tap tempo for the arpeggiator and the Octave switch selects Note Latch on or off (drone). The T3's sound engine circuitry is entirely based on the original T1's circuitry, so we're happy to report it really nails the original Taurus 1 nicely. It has the moody lows, the rumbling subs, the growl and all the essential T1 character. The VCOs are stable after just five minutes warm up, sound chunky and punchy with plenty of life. Though it would have been great to have more wave shapes onboard, it's amazing just how versatile these two sawtooth oscillators are in combination with the juicy Moog filter - not just for basses but for leads too. The T3 really does have something very unique about its sound that's hard to nail, even on other Moog synths, and the way the oscillators phase and bubble but never cancel is lovely, while the lows are smooth and musical and the filter opens up nicely in the highs too, with a wicked sizzle. There's nothing to complain about then, either in terms of sound quality or authenticity in comparison with the T1. Also note that Moog Voyager users can control the T3 over MIDI, with its major controls such as filter cutoff mapping to the T3's equivalents - a very nice touch. The T3 has a MIDI-syncable LFO with Square, Triangle, Ramp and Saw waves, plus a foot-controllable rate control and LFO amount to filter/pitch buttons, whose functions can be controlled simultaneously from the control wheel. This turns the wheel into a dual function mod wheel that also sends mod wheel MIDI CC data. The arpeggiator is MIDI-syncable and has foot controllable BPM with up, down and 'order' modes ('order' allows arpeggiation in the order the notes are played). It also has loop mode (cyclic) B/F (forward then reverse) and once (like a one shot, plays then stops). There's also an octave range parameter, a latch parameter (for sustained arpeggiation via one pedal press) while note latch adds each newly played notes into the pattern. All very useful. Above all else, the T3 is a faithful reproduction of the T1's sound and captures the overall vibe admirably, plus the T3's design is more elegant, built to a very high standard and adds welcome functionality, thus bringing the Taurus into the now. Moog has done itself proud with the T3, and though bass pedals are perhaps something of a niche product, the unique Taurus sound most certainly has universal appeal and we're excited to see how Moog might package this sound engine in the future. We'd love to see a cheaper Stage Edition and a Taurus rack for those who want the Taurus sound without the pedals. If you've been hunting for the T1 but you're tempted by the modern connectivity, the T3 comes at a sensible price point given its lush tones and gigantic sub that typifies the unique Moog sound. A classic reinvented.